Highly Reflective, and Low Emmistivity, our foils have British Board of Agrément approval and have been designed and tested to last the lifetime of a house or structure.... in the UK that is 60 years. Whether in roofs, walls, under floors or on HVAC ducts, correctly installed Apollo’s membranes have been tested and proven to enhance u-values and provide significant lifelong thermal insulation benefits. Our patented technology ensures that 96.1% of infrared energy striking the bright, tarnish resistant surfaces is blocked. As a result buildings are kept cooler in hot climates and warmer in cold climates. Correctly installed the systems offered will control heat convection, eliminate air leakage and infiltration. They are simple to install, are easily moulded around door or window frames and will not spring back. The products function as excellent vapour barriers, keeping other insulation dry thus maintaining its performance. Acting as air barriers, preventing air leakage and infiltration through the building’s envelope, ensures help to reduce energy bills. Traditional insulation works by slowing down convection and conduction. However, radiant heat loss is a major factor in a buildings thermal efficiency accounting for up to 80% of heat lost through walls with only around 20% lost via convection and conduction. The more radiant energy is reflected the less heat is transferred, our foil membranes reflect more than 95% of radiated heat. It is essential that insulation has a good thermal performance in summer and winter. When using Apollo's Heat Reflecting Membranes other qualities such as increased living space, durability, and ease of installation are also achieved. Every roll of Eco-Brite or Thermo-Foil ES (120m2 per roll) installed will save over 1400kg of Carbon Dioxide emissions per annum. For more than 15 years we have been manufacturing our range, constantly testing and improving our products. We have BBA certification, undergoing regular audits, and hold fire certificates to both BS 476 part 6 and 7. When it comes to quality every product in the Apollo range is manufactured in the UK under an ISO 9001 Certified Quality Management System. Apollo's HRM is the essential barrier to the elements for any building. 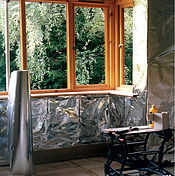 To act as a radiant barrier the HRM must be installed facing at least one air space, usually 19 to 25mm. This also creates a service void for electrical and piped services to be installed in front of the membrane. Please see below for a selection of examples of the improvement that installing Apollo’s membranes can achieve. We are more than happy to do a personalised U-value calculation for your structure free of charge.